During a round of Sunday show interviews, Trump's aides stressed that just a small portion of travelers had been affected by the order, which temporarily bars the citizens of seven majority Muslim nations from entering the country. The aides also reversed course and said that citizens of those countries who hold permanent U.S. residency "green cards" will not be barred from re-entering the U.S., as officials had previously said. "I can't imagine too many people out there watching this right now think it's unreasonable to ask a few more questions from someone traveling in and out of Libya and Yemen before being let loose in the United States," said Trump's chief of staff Reince Priebus. "And that's all this is." As of Sunday afternoon, one legal permanent resident had been denied entry to the country as a result of the order, according to a federal law enforcement official. The official was not permitted to discuss the order's impact publicly and spoke on the condition of anonymity. Homeland Security Secretary John Kelly issued a statement Sunday, saying he deemed the entry of lawful permanent residents to be in the national interest, and absent information indicating a serious threat to public safety and welfare, residency would be a "dispositive factor in our case-by-case determination." The changes, said White House adviser Kellyanne Conway, are "a small price to pay" to keep the nation safe. But it's unclear whether the order, which also suspends refugee admissions for 120 days and indefinitely bars the processing of refugees from Syria, will accomplish that. The order does not address homegrown extremists already in America, a primary concern of federal law enforcement officials. And the list of countries in Trump's order doesn't include Saudi Arabia, where most of the Sept. 11 hijackers were from. Priebus said that other countries could be added to the list. Trump spoke by phone Sunday with leaders from Saudi Arabia and the United Arab Emirates, two countries not affected by the change. The order has sparked widespread protests and denunciations from Democrats and a handful of Republicans. Many have accused the administration of rushing to implement the changes, resulting in panic and confusion at the nation's airports. Several Democrats in Congress said they would be introducing legislation to stop the ban. Trump, meanwhile, defended his actions, saying in a statement that America "will continue to show compassion to those fleeing oppression" while protecting its own citizens. He said he has "tremendous feeling" for the people fleeing the bloody civil war in Syria and vowed to "find ways to help all those who are suffering." The White House said later that King Salman of Saudi Arabia and Sheikh Mohammed bin Zayed Al Nahyan, the crown prince of Abu Dhabi, the capital of the United Arab Emirates, had both agreed to support safe zones for refugees, but offered no further details. 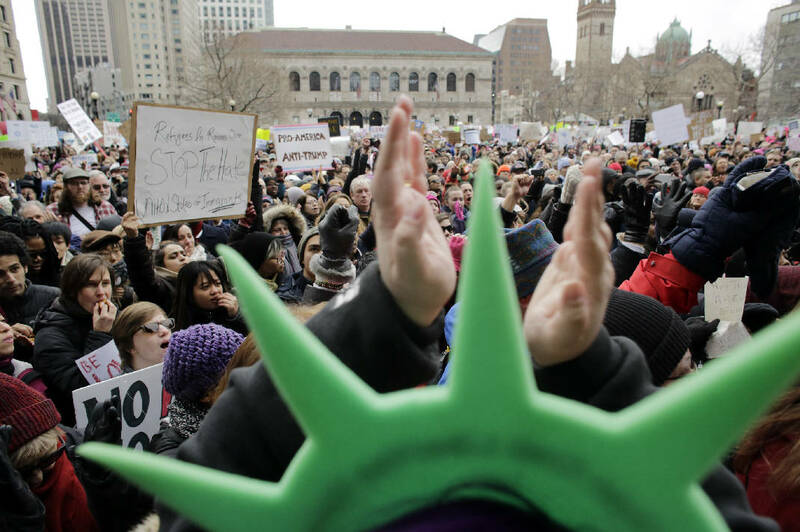 The comments came the morning after a federal judge in New York issued an emergency order temporarily barring the U.S. from deporting people from the seven majority Muslim nations subject to Trump's 90-day travel ban. The judge said travelers who had been detained had a strong argument that their legal rights had been violated. "President Trump's executive orders remain in place — prohibited travel will remain prohibited, and the U.S. government retains its right to revoke visas at any time if required for national security or public safety," the department said in a statement. Senate Majority Leader Mitch McConnell, R-Ky., said he supports more stringent screening mechanisms, though he cautioned that Muslims are some of the country's "best sources in the war against terror." Republican Sens. John McCain and Lindsey Graham, meanwhile, warned of unintended consequences, expressing fear the order could "become a self-inflicted wound in the fight against terrorism." Koch political network, which is among the most influential players in the conservative movement, also condemned the plan Sunday. "We believe it is possible to keep Americans safe without excluding people who wish to come here to contribute and pursue a better life for their families," network co-chairman Brian Hooks said in a statement. Priebus was on NBC's "Meet the Press" and Portman was on CNN's "State of the Union," while McConnell appeared on ABC's "This Week." Associated Press writers Alicia Caldwell and Steve Peoples in Palm Springs, California, contributed to this report.